Tungle - Taking Meeting Organization into the "Open"
New service provides format- and platform-agnostic meeting scheduling and co-ordination across the web. To date groupware’s ability to perform meeting scheduling and coordination was limited to within an enterprise’s groupware community of users — i.e. – the employees and perhaps closely connected business associates. And everyone had to be using a common calendaring system running under a common operating system. Yet, studies show that over 60% of meetings will involve invitees who are not within this “enterprise cloud”. Half of those “non-cloud” invitees do have a “good” relationship with the enterprise; the other half are those with whom employees would have “sporadic” meetings. Tungle is an Internet-based service that provides the ability to share availability and manage meeting scheduling across the web. Currently the designated organizer of the meeting (who does not have to be an attendee) must be using Microsoft Outlook; however, the invitees can be running on any platform, whether Windows, Mac or even Blackberry; they simply need a web browser. And they can be using any calendaring application whether Outlook Calendar, Google Calendar, Mac’s iCal, or within groupware such as Lotus Notes. The Tungle client for meeting organizers has a single-click install as an Outlook plug-in. Upon installation it then searches your Outlook for both Contacts and your availability according to your Outlook Calendar. If it finds other Contacts who also have installed Tungle it marks them with an identifier “T” logo. 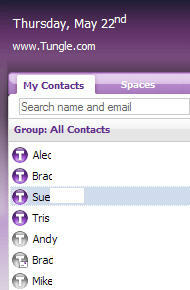 You may then invite individual contacts to “share” their availability; those are the ones identified with the “T” logo on a solid purple background. 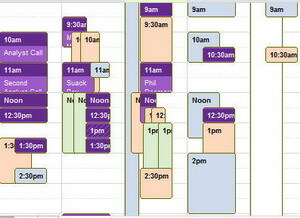 Select one of those contacts and you will see in the Calendar screen that contact’s availability. The other section of the Tungle client comprises a Calendar which initially shows your own availability for the current (5-day or 7-day) week. This Calendar section is where you initiate the coordination of a meeting – selecting contacts, entering a subject and designating the time slots you (or the primary “chair” of the meeting) would have available for potential meeting times. You can also designate whether or not you will be attending the meeting – a feature that is ideal for executive administrators. The example on the left shows the sharing of availability across an organizer and three other contacts, shown by the different colors, who are also on Tungle. (Were the organizer not attending the purple slots would go away.) The organizer would then “paint” in blank potential time slots for the proposed meeting. Upon completion of this information, click on the “Create Space” button and another window pops up where you can see a summary of the invitees and proposed time slots and as well as enter more detailed information about the potential meeting such as an agenda. Click on the “Send” button and an email, from the meeting organizer, about the prospective meeting goes out to each invitee, incorporating a link. The link is to a “Tungle Space” which is a dynamic web page, viewable in any web browser, that shows all the meeting information and allows invitees to select which of the proposed time slots s/he prefers. 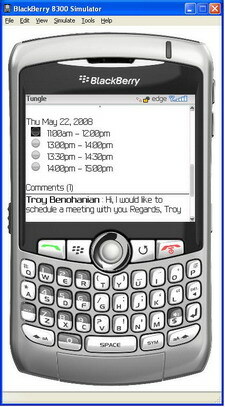 If the invitee reads the email on a Blackberry, the Tungle Space is reformatted for appropriate display on the Blackberry. Note that, until a final meeting time is set, the Tungle Space is updated with any changes in availability of those who have a Tungle client installed. Once the last invitee has visited the Tungle Space to select her/his available meeting times, Tungle will then automatically select a meeting time. Once a meeting time is selected an email goes out to all invitees announcing the meeting time. Those invitees who are also on Tungle will have their Outlook Calendars appropriately populated. But here is one of the key features: the other invitees can click on a link that inserts the meeting time into their respective calendaring program regardless of whether whether they use Google Calendar, iCal, Lotus Notes or any other popular Calendaring program. ease-of- user was a key design criteria; this is an offering that has been over a year in the development. the team is still working on additional features incorporating feedback from the current beta phase. The entire structure is set up to ensure adequate privacy; only information you agree to share is shared. In fact, as with Skype, while users’ email addresses are registered by Tungle and used to determine who amongst your Contacts is on Tungle, this information is never give out at any point. There is even a double opt-in process for ensuring that you are, in fact, the owner of any email address that you register with Tungle. Personally I have used Tungle over the past week with great success. It’s simple to install and eliminates lots of non-productive time exchanging emails with various meeting time slot proposals (or even making voice calls to finalize details). . In fact, Tungle appears to be one of those rare productivity applications whose value is quickly appreciated the first time you use it. Going forward I have suggested API’s that could link Tungle as a front end for hosts organizing VAPPS HiDef Conferencing sessions (or even Skype Conference call sessions); I can also foresee where deeper direct integration into Blackberry Calendar or CRM applications, such as Salesforce.com, would be useful. And it’s ideal for Skylook users who already are archiving their Skype conversations into Outlook. Tungle does have plans for making this an integral web-based “social networking” tool that is “just there” when you have to organize a meeting. So, if you are an Outlook user, download Tungle here and get organizing!